It is the Second Age of Earth. In an unnamed kingdom far to the north, the Explorer's League has dispatched one of its newest agents, you, to go searching for one of its named operatives in a village called Argoth; a tiny village with a connection to old ruins, rumored to contain hidden secrets. No one has ever cracked the code of those ruins, but the operative said that he had found the key before he disappeared. Now, darkness has been rumored to spread across the land in the form of a terrible fog, and rumor has it that a strange cult is beginning to pop up in surrounding lands. Is there a connection? The League expects you to find out. 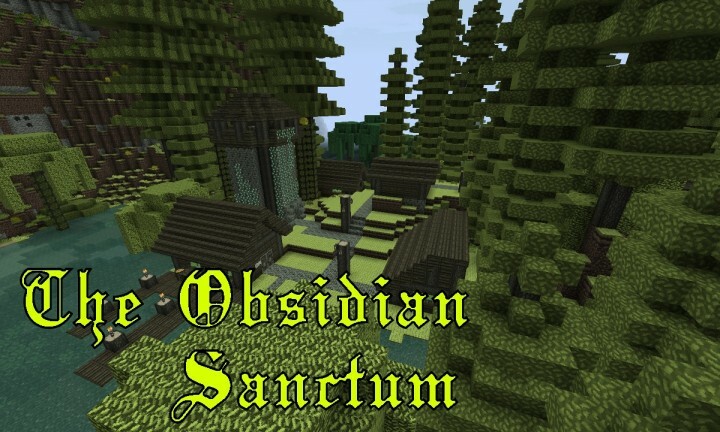 The Obsidian Sanctum is my current map project. A remake of a very old map I made when I was still in high school, this modded version is exactly how I wanted the original map to be. Unlike the last map, which I made entirely in survival and released on its own after it was done, I've decided to make this version much more interactive with the community by releasing regular alphas of the map's progress, so that I can get bugfixing and other such problems done much faster, AND to listen to peoples' recommendations, such as the addition of different characters and maybe monsters as well. I'm hoping to get this done in a timely fashion, and when all the primary bug fixing is done the full release will include a main storyline, several optional locations to travel and gather loot, a custom resource pack (though I'm tempted to just make my own variant of my favorite texture pack, Dark Dokucraft), custom sounds, and even its own original soundtrack! The reason why I wanted to use mods for this map is because I feel like it would be a shame if they didn't get included. There's a lot of great modders out there whose mods are very well known but beyond survival never really get much attention. Save for modpacks, the only real purpose these mods serve on the get-go is to help add to the classic survival or creative mode experiences. Regardless, there's an entire subculture of the Minecraft fanbase that likes to play and make adventure maps still, and it would be a shame not to include such mods, especially since they add so much depth. Thus far, my biggest example in how mods can benefit map making is Noppe's CustomNPCs, which not only includes the ability to make your own unique NPCs in your Minecraft world, but it has a huge array of blocks and weapons available to just add that immersion that your Minecraft world was lacking before. Combine that with Bibliocraft, Balkon's Weaponmod, Tinker's Construct, and Mo'Creatures, and you've got yourself a party that never stops. Anyway, if you want to check out more, take a look at this map's dedicated PlanetMinecraft page, where I make regular updates and have posted both a teaser for the map and the initial showcase alpha. I'm thinking that I will wait for a while until I have a version that's a bit more complete before posting it on the site, but until then I'll keep you posted. I hope you guys check it out! Help my children grow, young ones! Help them grow!